The all-new 2018 Jeep Wrangler is a highly anticipated vehicle for many reasons, most notably its unmatchable capability and endless customization options. However, another amazing aspect of the Wrangler is the technology it has gained for the all-new 2018 model year, including the latest Uconnect systems and safety systems. Learn more about the technology found in the all-new 2018 Jeep Wrangler by reading below! The all-new Wrangler features the fourth generation of the award-winning Uconnect technology. This infotainment technology provides access to a wonderful range of entertainment, navigation, and connectivity features. 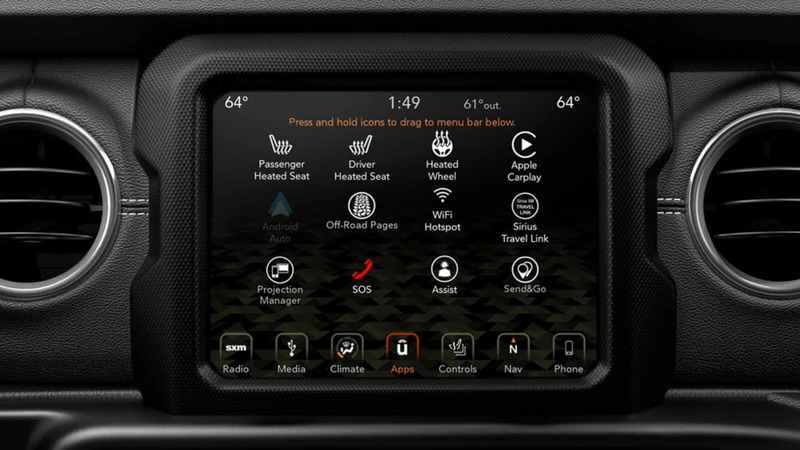 There are three new Uconnect systems offered with the 2018 Wrangler: the Uconnect 5-, 7- and 8.4NAV. Each of these systems has a full-color LED instrument cluster. The latest Uconnect system is in its fourth generation, and it has earned acclaim for its faster startup times, enhanced processing power, easy and intuitive features, and high-resolution graphics. One of the most exciting aspects of the fourth-generation Uconnect system is its compatibility with Android Auto and Apple CarPlay, which can be found with the 7.0 and 8.4NAV systems. Apple CarPlay allows iPhone users to integrate their smartphone with the Wrangler's display. It provides drivers with access to Siri Voice Control, and allows drivers to send/receive messages, make phone calls, access music, and receive voice-guided navigation. Android Auto makes it easy to access the innovative Google technology, including Google Maps with live traffic information, voice-guided navigation, and lane guidance. You can easily perform hands-free operations to place phone calls, receive or send messages, and even have your questions answered by Google. The Uconnect 4C NAV system provides access to built-in navigation, offering customers 3D imagery of city models, landmarks, and the digital terrain. It is paired with the 8.4-inch touchscreen and can provide drivers with directions, points of interest, and lane guidance to keep you going in the right direction. SiriusXM Travel Link provides helpful information like traffic and weather reports, fuel prices, and both in-game and final scores for your favorite sports teams. Another amazing aspect of the Uconnect 4C NAV system is that it is available with a 4G LTE Wi-Fi hotspot to keep you connected wherever you go. Up to eight mobile devices can be connected while inside the vehicle, or from approximately 50 feet away. Jeep offers their extraordinary all-new Wrangler with the latest safety and security features, including driver assistance technologies. The Wrangler is available with the ParkView rear backup camera, rear park assist, and the Blind-spot Monitoring and Rear Cross Path detection systems. Jeep has equipped the Wrangler with four standard airbags, including seat-mounted side pelvic-thorax air bags. The all-speed traction control system works to prevent wheel slip. There are many great security features, including roadside assistance and SOS call. These assistance features are activated through buttons located on the overhead console. Pressing the button can alert roadside assistance, emergency services, and Uconnect Customer Care, as well as put you in touch for non-collision related emergencies. We would love to tell you more about the outstanding all-new 2018 Jeep Wrangler, so get in touch with us today at East Hills Chrysler Jeep Dodge Ram!